The country’s leading telecom provider, Globe, treated the public with two concerts over the weekend showcasing the best emerging local artists in the music scene. Both music events -- Live Street: Make Snow Possible and Sundown Sessions -- were attended by over a thousand OPM lovers chilling the night out with their friends and families. 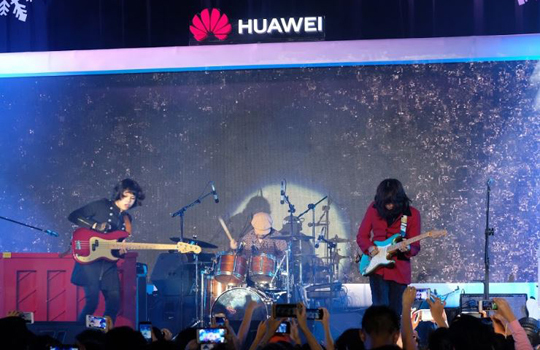 Globe Live and Bonifacio High Street, together with Huawei, kicked off the holiday season with Live Street: Make Snow Possible on December 14 creating a white Christmas atmosphere while enjoying the sounds of IV of Spades, Karencitta, Pinopela, Rouge and Manila String Machine. Pinopela, an a capella group who won the top prize at the international Acapella Championships in Singapore last 2016, made the concert goers relaxed with their perfect voice blending singing hits such as “Ikaw Nga,” “Sirena" and “Do You Hear What I Hear.” The group also sang Christmas songs such as their medley of “Winter Wonderland,” “Let It Snow,” and “I Saw Mommy Kissing Santa Claus”. All-girl rock band Rouge collaborated with Manila String Machine in performing their own rendition of popular Christmas hits such as “Last Christmas,” “Christmas in Our Hearts,” “Pasko Na Sinta Ko,” and “Winter Wonderland,” to name a few. The OPM beats continued the next day as Globe and Spotify presented the Sundown Sessions at Bonifacio High Street Activity Center. Concertgoers flocked to the venue with their loved ones and enjoyed performances from BP Valenzuela, She’s Only Sixteen, Oh! Flamingo, and Bea Lorenzo. Plus, they won special prizes from Globe Postpaid and Spotify! Elements Music Camp artist Bea Lorenzo kicked off the show by starting with her original composition, “Stars”. She also sang “Ili (Hush)” and “Golden”. Next up was indie electronic pop artist BP Valenzuela. The audience got to relax and chill out to her soulful performance of “Even If You Asked Me”, “All I Need”, and “Where I’m Calling From”. Pop-rock indie band She's Only Sixteen then took the stage. Their wonderful set - consisting of "Magic", “Dying to Meet You”, and “Leave Me Out of It” - got everyone bobbing their heads and singing along. Wrapping up the night was indie rock band Oh Flamingo, with their performance of “Inconsistencies”, “Reflections”, and “Sacred Times”. With all these exciting performances from the hottest local acts, Globe definitely created a weekend to remember for OPM fans! To continue enjoying these local artists and more anytime, Globe Postpaid customers can enjoy 30 days of Premium for only P129 by simply texting SP129 to 8080. Stay tuned to the latest local music events by following Globe on https://www.facebook.com/globeph/ and https://twitter.com/enjoyGLOBE.